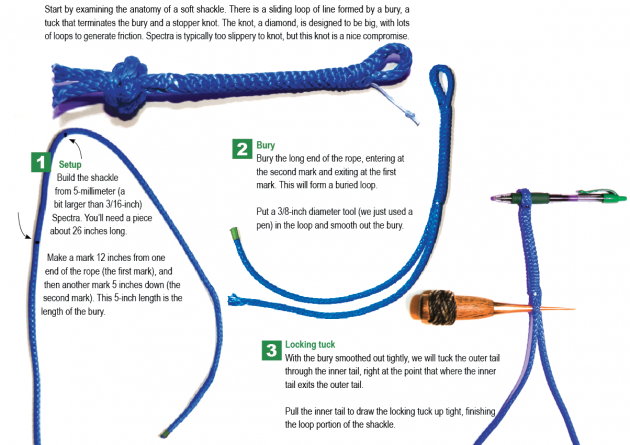 Many sailors know a variety of useful splices, but advances in line technology have expanded the roles lines play on boats, even going so far as to replace heavy hardware in some cases. Ultra high molecular weight polyethylene, commonly known as Spectra or Dyneema is a game changer in the world of sailboat rigging. It is cheaper, lighter, stronger per pound, less abrasive and almost as abrasion resistant as stainless steel wire. It doesn't corrode or fracture, and won't fail without warning. Adding to the benefits, Spectra can be terminated with simple hand tools, by you, anywhere. Spectra is used to build soft shackles, essentially a length rope tucked and knotted to replace traditional shackles. The shackles can be used to attach blocks to pad eyes, jib sheets to clew rings, most any place you'd use a D and snap shackle. They are soft so you can use them to attach to materials that would be damaged by a metal shackle-like attaching a block to an aluminum toerail. They can be very strong and will articulate freely. Operationally, soft shackles are simple; they have a sliding eye loop at one end and large spherical stopper knot at the other. Pull the loop open, slide it over the stopper, and milk the loop back down. The constricted loop will draw tight right below the knot and lock the whole thing together. Soft shackles are just about as strong as the material they are made of, the structure is largely doubled so the load is spread across a lot of material. The weak point is the knot-it can pull out, but at just about the tensile strength of the line itself. These fabrications can be relatively expensive to buy, but a few dollars' worth of line and a little skill quickly becomes a $20 piece of "hardware." 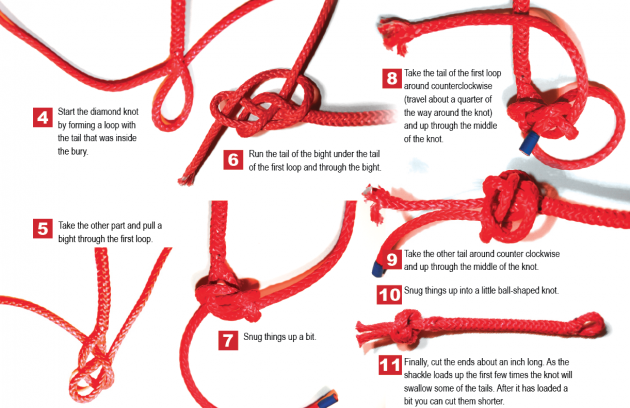 Luckily these are very easy to make, using just a few basic splicing skills and one complex but manageable knot. Use a marker, tape measure, scissors, some type of tucking tool and a small awl. 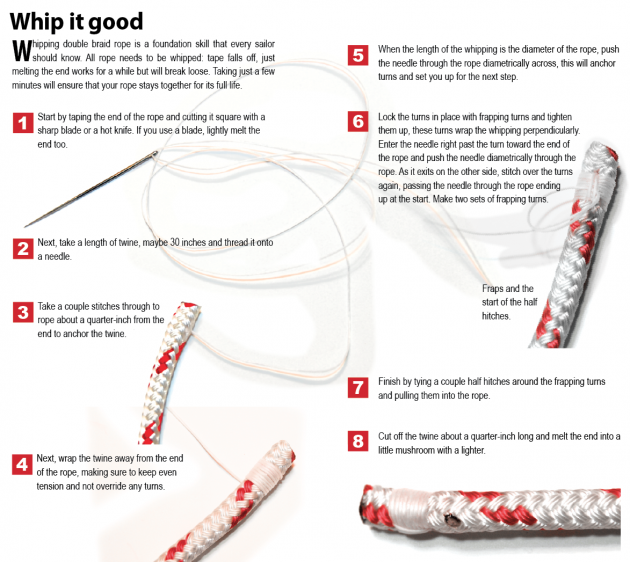 The tucking tool can be a traditional tubular fid in a diameter to match your rope, but I prefer the Splicing Wand created by Brion Toss Yacht Riggers (www.briontoss.com). These same tools can be used for eye splicing Spectra or other line.